Facebook has been caught taking money for nothing. As well as providing a platform for the products of Zynga and its corporation-sized ilk, Facebook has spent the past few years offering its services to small, less conspicuous app developers. To help these smaller devs stand out and make users feel more comfortable with them, Facebook offered to verify their apps for a fee of $375 ($175 for student or non-profit projects) and provide them with badges intended to let users know that their apps were trustworthy. Nice as this sounds, the Federal Trade Commission (FTC) has now revealed that Facebook never actually investigated or scrutinized any of the apps paying the verification fee. According to the FTC, Facebook received up to $95,000 from its verified app scheme prior to shutting the it down in 2009, just six months after it was launched. In addition to providing "verified" apps with a badge letting users know that Facebook trusted them, the $375 also bought enhanced prominence in search results and a higher ranking in the site's apps directory. 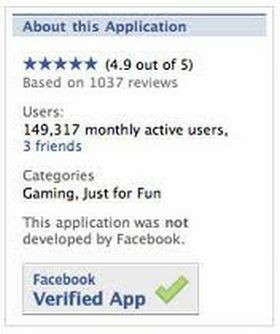 In its report, the FTC says that, "Before it awarded the Verified Apps badge, Facebook took no steps to verify either the security of a verified application's website or the security the application provided for the user information it collected, beyond such steps as it may have taken regarding any other Platform Application." The FTC also suggests that customers may have been deceived by the verified app badges, as they too were under the impression that they were "designed to offer extra assurances to help users identify applications they can trust... that are secure, respectful and transparent, and have demonstrated commitment to compliance with platform policies." These findings form part of a comphrensive investigation into Facebook's privacy practices undertaken by the FTC. The case has now been settled, with Facebook agreeing to allow an independent watchdog to conduct investigations into its practices every two years until 2032. According to the FTC, the settlement also requires that Facebook "take several steps to make sure it lives up to its promises in the future, including by giving consumers clear and prominent notice and obtaining their express consent before sharing their information beyond their privacy settings, by maintaining a comprehensive privacy program to protect consumers' information."